Principles of Finance Featured: Boundless: "Finance: Chapter 6, Section 3: Key Characteristics of Bonds"
Boundless: "Finance: Chapter 6, Section 3: Key Characteristics of Bonds"
Par value is the amount of money a holder will get back once a bond matures; a bond can be sold at par, at premium, or discount. The coupon rate is the amount of interest that the bondholder will receive per payment, expressed as a percentage of the par value. Maturity date refers to the final payment date of a loan or other financial instrument. A callable bond allows the issuer to redeem the bond before the maturity date; this is likely to happen when interest rates go down. A sinking fund is a method by which an organization sets aside money to retire debts. Other important features of bonds include the yield, market price, and putability of a bond. Par value is the amount of money a holder will get back once a bond matures; a bond can be sold at par, at premium, or discount. When a bond trades at a price above the face value, it is said to be selling at a premium. When a bond sells below face value, it is said to be selling at a discount. A bond's price fluctuates throughout its life in response to a number of variables, including interest rates and time to maturity. Pull to par is the effect in which the price of a bond converges to par value as time passes. At maturity, the price of a debt instrument in good standing should equal its par (or face value). resale market: The resale market, also called "secondary market" or "aftermarket," is the financial market in which previously issued financial instruments, such as stock, bonds, options, and futures, are bought and sold. Par value/face value (also known as the principal) is the amount of money a holder will get back once a bond matures. Par value means stated value or face value in finance and accounting. From this comes the expressions at par (at the par value), over par (over par value) and under par (under par value). A newly issued bond usually sells at the par value. Corporate bonds normally have a par value of $1,000, but this amount can be much greater for government bonds. What confuses many people is that the par value is not the price of the bond. A bond's price fluctuates throughout its life in response to a number of variables, including interest rates and time to maturity. When a bond trades at a price above the face value, it is said to be selling at a premium. When a bond sells below face value, it is said to be selling at a discount. Pull to par is the effect in which the price of a bond converges to par value as time passes. At maturity, the price of a debt instrument in good standing should equal its par (or face value). Another name for this effect is "reduction of maturity. " It results from the difference between market interest rate and the nominal yield on the bond. A bond selling at par has a coupon rate such that the bond is worth an amount equivalent to its original issue value or its value upon redemption at maturity. In other words, if you buy a bond at face value, or par, when it is issued and hold it until it matures, you'll earn interest at the stated, or coupon, rate. For example, if you buy a 20-year $1,000 bond paying $550 a year for 20 years. The yield, or your return on investment, will also be 5%. You will get your $1,000 back when the 20 years are up. You can also buy and sell bonds through a broker after their date of issue. This is known as the "secondary market" or "resale market. " The coupon rate is the amount of interest that the bondholder will receive per payment, expressed as a percentage of the par value. Coupon interest rate is usually fixed throughout the life of the bond. It can also vary with a money market index. Not all bonds have coupons. Zero-coupon bonds are those that pay no coupons and thus have a coupon rate of 0%. Based on different coupon rates, there are fixed rate bonds, floating rate bonds, and inflation linked bonds. The value of money, figuring in a given amount of interest, earned over a given amount of time. The coupon rate is the amount of interest that the bondholder will receive expressed as a percentage of the par value. Thus, if a bond has a par value of 1,000 and a coupon rate of 10,100 a year during the time between when the bond is issued and when it matures. Usually this rate is fixed throughout the life of the bond. It can also vary with a money market index, such as LIBOR, or it can be even more exotic. The bond will also specify when the interest is to be paid, whether monthly, quarterly, semi-annually, or annually. A coupon payment on a bond is a periodic interest payment that the bond holder receives during the time between when the bond is issued and when it matures. The name "coupon" arose because in the past, paper bond certificates were issued that had coupons attached to them, one for each interest payment. On the due dates, the bondholder would hand in the coupon to a bank in exchange for the interest payment. Not all bonds have coupons. Zero-coupon bonds are those that pay no coupons and thus have a coupon rate of 0%. Such bonds make only one payment–the payment of the face value on the maturity date. Normally, to compensate the bondholder for the time value of money, the price of a zero-coupon bond will always be less than its face value on any date before the maturity date. The bondholder receives the full principal amount on the redemption date. An example of zero coupon bonds is Series E savings bonds issued by the U.S. government. Based on different coupon rates, bonds are classified into many types. Fixed-rate bonds have a coupon that remains constant throughout the life of the bond. A variation are stepped-coupon bonds, with a coupon that increases during the life of the bond. Floating rate notes (FRNs, floaters) have a variable coupon that is linked to a reference rate of interest, such as LIBOR or Euribor. For example, the coupon may be defined as three month USD LIBOR + 0.20%. The coupon rate is recalculated periodically, typically every one or three months. Inflation linked bonds (linkers), in which the principal amount and the interest payments are indexed to inflation. The interest rate is normally lower than for fixed rate bonds with a comparable maturity. However, as the principal amount grows, the payments increase with inflation. The United Kingdom was the first sovereign issuer to issue inflation linked Gilts in the 1980s. Treasury Inflation-Protected Securities (TIPS) and I-bonds are examples of inflation linked bonds issued by the U.S. government. Maturity date refers to the final payment date of a loan or other financial instrument. As long as all due payments have been made, the issuer has no further obligations to the bond holders after the maturity date. The length of time until the maturity date is often referred to as the term or tenor or maturity of a bond. In the market for United States Treasury securities, there are three categories of bond maturities: short term, medium term, and long term. A callable bond (also called "redeemable bond") is a type of bond (debt security) that allows the issuer of the bond to retain the privilege of redeeming the bond at some point before the bond reaches its date of maturity. Puttable bond (put bond, putable, or retractable bond) is a bond with an embedded put option. The holder of the puttable bond has the right, but not the obligation, to demand early repayment of the principal. In finance, maturity date or redemption date, refers to the final payment date of a loan or other financial instrument, at which point the principal (and all remaining interest) is due to be paid. The first Austrian bonds had 5% rates of return and a five-year maturity. The issuer has to repay the nominal amount on the maturity date. As long as all due payments have been made, the issuer has no further obligations to the bond holders after the maturity date. The length of time until the maturity date is often referred to as the term or tenor or maturity of a bond. The maturity can be any length of time, although debt securities with a term of less than one year are generally designated money market instruments rather than bonds. Most bonds have a term of up to 30 years. Some bonds have been issued with terms of 50 years or more and, historically, there have been some issues with no maturity date (irredeemables). long term (bonds): maturities greater than 12 years. Normally the maturity of a bond is fixed. However, it is important to note that bonds are sometimes "callable,"which means that the issuer of the debt is able to pay back the principal at any time. In this case, the maturity date is the day when the bond is called. Thus, investors should inquire, before buying any fixed-income securities, whether the bond is callable or not. Bonds can also be puttable, meaning that the holder has the right, but not the obligation, to demand early repayment of the principal. Similarly, the maturity date, if applicable, is the date as the bond is redeemed. A callable bond allows the issuer to redeem the bond before the maturity date; this is likely to happen when interest rates go down. A callable bond is a type of bond that allows the issuer of the bond to retain the privilege of redeeming the bond at some point before the bond reaches its date of maturity. If interest rates in the market have gone down by the time of the call date, the issuer will be able to refinance its debt at a cheaper level and so will be incentivized to call the bonds it originally issued. Most callable bonds allow the issuer to repay the bond at par. With some bonds, the issuer has to pay a premium, known as the call premium. Price of callable bond = Price of straight bond – Price of call option. Price of a callable bond is always lower than the price of a straight bond because the call option adds value to an issuer. A straight bond is a bond with no embedded options (call or put options). Equal value; equality of nominal and actual value; the value expressed on the face or in the words of a certificate of value, as a bond or other commercial paper. Occasionally a bond may contain an embedded option. That is, it grants option-like features to the holder or the issuer. A callable bond (also called redeemable bond) is a type of bond that allows the issuer of the bond to retain the privilege of redeeming the bond at some point before the bond reaches its date of maturity. In other words, on the call date, the issuer has the right, but not the obligation, to buy back the bonds from the bond holders at a defined call price. Technically speaking, the bonds are not really bought and held by the issuer. They are instead cancelled immediately. Call dates are the dates on which callable bonds can be redeemed early. There are three main categories. A Bermudan callable has several call dates, usually coinciding with coupon dates. A European callable has only one call date. This is a special case of a Bermudan callable. An American callable can be called at any time until the maturity date. This Bond is one of the 400 issued to the Central Pacific Rail Road Company of California and 200 to the Western Pacific Rail Road Company in 1865 under the Act of the California Legislature passed on April 22, 1863. Coupon #1 was redeemed and cancelled on November 2, 1865, and coupon #35 on November 2, 1882, at which time the principal of $1,000.00 in gold coin was also paid from the Treasury of the City and County of San Francisco and the Bond was cancelled. Most callable bonds allow the issuer to repay the bond at par. With some bonds, the issuer has to pay a premium, known as the call premium. This is mainly the case for high-yield bonds. These have very strict covenants, restricting the issuer in its operations. To be free from these covenants, the issuer can repay the bonds early, but only at a high cost. The issuer has an option, for which it pays in the form of a higher coupon rate. If interest rates in the market have gone down by the time of the call date, the issuer will be able to refinance its debt at a cheaper level. The issuer will be incentivized to call the bonds it originally issued. Another way to look at this interplay is that as interest rates go down, the price of the bonds goes up. Therefore, it is advantageous to buy the bonds back at par value. With a callable bond, investors have the benefit of a higher coupon than they would have had with a straight, non-callable bond. On the other hand, if interest rates fall, the bonds will likely be called, and they can only invest at the lower rate. The price behavior of a callable bond is the opposite of that of puttable bond. Since call option and put option are not mutually exclusive, a bond may have both options embedded. Price of a callable bond is always lower than the price of a straight bond because the call option adds value to an issuer. Similarly, yield on a callable bond is higher than the yield on a straight bond. A sinking fund is a method by which an organization sets aside money to retire debts. Sinking fund provision of the corporate bond indenture requires a certain portion of the issue to be retired periodically. A sinking fund reduces credit risk but presents reinvestment risk to bondholders. For the creditors, the fund reduces the risk the organization will default when the principal is due: it reduces credit risk. However, if the bonds are callable, this comes at a cost to creditors, because the organization has an option on the bonds. Stock with a dividend, usually fixed, that is paid out of profits before any dividend can be paid on common stock. It also has priority to common stock in liquidation. A debenture is a document that either creates a debt or acknowledges it, and it is a debt without collateral. In modern finance, a sinking fund is a method by which an organization sets aside money over time to retire its indebtedness by repaying or purchasing outstanding loans and securities held against the entity. More specifically, it is a fund into which money can be deposited, so that over time preferred stock, debentures or stocks can be retired. Sinking funds can also be used to set aside money for purposes of replacing capital equipment as it becomes obsolete . Sinking fund provision of the corporate bond indenture requires a certain portion of the issue to be retired periodically. The entire bond issue can be liquidated by the maturity date. Issuers may either pay to trustees, which in turn call randomly selected bonds in the issue, or, alternatively, purchase bonds in open market, then return them to trustees. The firm may repurchase a fraction of the outstanding bonds in the open market each year. The firm may repurchase a fraction of outstanding bonds at a special call price associated with the sinking fund provision (they are callable bonds). The firm has the option to repurchase the bonds at either the market price or the sinking fund price, whichever is lower. The firm can only repurchase a limited fraction of the bond issue at the sinking fund price. At best some indentures allow firms to use a doubling option, which allows repurchase of double the required number of bonds at the sinking fund price. For the creditors, the fund reduces the risk the organization will default when the principal is due: it reduces credit risk. However, if the bonds are callable, this comes at a cost to creditors, because the organization has an option on the bonds: The firm will choose to buy back discount bonds (selling below par) at their market price,while exercising its option to buy back premium bonds (selling above par) at par. Therefore, if interest rates fall and bond prices rise, a firm will benefit from the sinking fund provision that enables it to repurchase its bonds at below-market prices. In this case, the firm's gain is the bondholder's loss–thus callable bonds will typically be issued at a higher coupon rate, reflecting the value of the option. Other important features of bonds include the yield, market price and putability of a bond. The yield is the rate of return received from investing in the bond. It usually refers either to the current yield, or to the yield to maturity or redemption yield. The market price of a tradeable bond will be influenced by the amounts, currency and timing of the interest payments and capital repayment due, the quality of the bond, and the available redemption yield of other comparable bonds which can be traded in the markets. Some bonds give the holder the right to force the issuer to repay the bond before the maturity date on the put dates. These are referred to as retractable or putable bonds. the price of a bond excluding any interest that has accrued since issue or the most recent coupon payment. The internal rate of return on a bond held to maturity, assuming scheduled payment of principal and interest. Some other important features of bonds are presented below, namely the yield, market price and putability of a bond. $1,000 (30 year, 7%) "Pacific Railroad Bond" (#93 of 200) issued by the City and County of San Francisco under "An Act to Authorize the Board of Supervisors of the City and County of San Francisco to take and subscribe One Million Dollars to the Capital Stock of the Western Pacific Rail Road Company and the Central Pacific Rail Road Company of California and to provide for the payment of the same and other matters relating thereto" approved on April 22, 1863, as amended by section Five of the "Compromise Act" approved on April 4, 1864, to fund the construction of the Western Pacific Railroad between San Francisco Bay (at Alameda) and the CPRR of Cal. at Sacramento, dated May 1, 1865. The yield is the rate of return received from investing in the bond. It usually refers either to the current yield, which is simply the annual interest payment divided by the current market price of the bond (often the clean price), or to the yield to maturity or redemption yield. Yield to maturity is a more useful measure of the return of the bond, taking into account the current market price, the amount and timing of all remaining coupon payments, and of the repayment due on maturity. 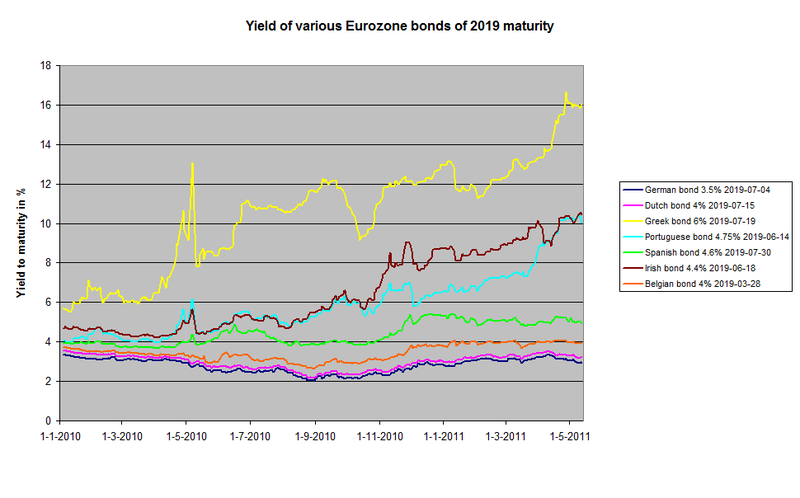 Development of yield to maturity of bonds of 2019 maturity of a number of Eurozone governments. The market price of a tradeable bond will be influenced - amongst other things - by the amounts, currency and timing of the interest payments and capital repayment due; the quality of the bond; and the available redemption yield of other comparable bonds which can be traded in the markets. The price can be quoted as clean or dirty. "Dirty" refers to the actual price to be paid; while "clean" includes an adjustment for accrued interest. The issue price at which investors buy the bonds when they are first issued will typically be approximately equal to the nominal amount. The net proceeds that the issuer receives are thus the issue price, less issuance fees. The market price of the bond will vary over its life: it may trade at a premium (above par, usually because market interest rates have fallen since issue), or at a discount (below par, if market rates have risen or there is a high probability of default on the bond). Some bonds give the holder the right to force the issuer to repay the bond before the maturity date on the put dates. These are referred to as retractable or putable bonds. Put dates are the dates on which putable bonds can be redeemed early. This type of bond protects investors: if interest rates rise after bond purchase, the future value of coupon payments will become less valuable. Therefore, investors sell bonds back to the issuer and may lend proceeds elsewhere at a higher rate. Bondholders are ready to pay for such protection by accepting a lower yield relative to that of a straight bond. A death put is an optional redemption feature on a debt instrument allowing the beneficiary of the estate of a deceased bondholder to put (sell) the bond (back to the issuer) at face value in the event of the bondholder's death or legal incapacitation. Price of a puttable bond is always higher than the price of a straight bond because the put option adds value to an investor. Yield on a puttable bond is lower than the yield on a straight bond. ◄ Boundless: "Finance: Chapter 6, Section 2: Additional Detail on Interest Rates"